What do a fisherman, a soccer fan, and missing cattle have to do with free expression? What do a fisherman, a soccer fan, and missing cattle have in common? The criminalization of free expression over social media. From Malaysia, to Uganda, to Tanzania, there are worrying laws that can send people to jail for what they post online. Here’s a closer look at what’s happening, and how activists are pushing back. Both a fisherman and a soccer fan were arrested for their social media posts in the Malaysian province of Johor. In May, a 46-year-old fisherman was taken into custody directly from a fishing vessel near the island of Pulau Tioman after he published a post that allegedly insulted the Sultan of Johor — a constitutional monarch in the province. Earlier that week, a soccer fan named Masyhur Abdullah was detained for insulting the Sultan’s son, the crown prince, by criticizing the prince’s management of local soccer club Johor Darul Takzim. 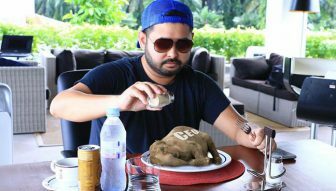 The fan circulated a photoshopped image showing the crown prince feasting on a chicken-sized elephant, the symbol for another soccer team, Pahang. Fortunately, in each case, the prosecutor declined to press charges — yet the law still stands that would allow these kinds of cases to proceed (section 233 of the Communications and Multimedia Act of 1998). These are not isolated cases in Malaysia, which may soon pass even more restrictive laws impacting free expression. As we noted last month, the government is considering amendments to the Communications Act that would criminalize some types of online behavior and make internet service providers liable for content passing over their networks — removing protections against intermediary liability. For now, activists have beaten back these amendments. Yet the Malaysian parliament may still reconsider them in November. In Uganda, a journalist faces charges for criminal libel because of a Facebook post, according to the civil society group Unwanted Witness. Mr. Sadat Waligo posted a story on Facebook suggesting that there’s a link between a local official and the theft of 200 head of cattle from the farm of a former Deputy Prime Minister. Mr. Waligo was charged charged under Section 179 of the Penal Code Act with libel and detained in Kakondo prison before being released on bail for U.S. $150. In Dar es Salaam, Tanzania, a WhatsApp user faces criminal charges for making jokes about President John Magufuli, the second such case in a month. Two weeks earlier, a resident of Arusha, Tanzania was sentenced to three years in jail for insulting the president. As U.N. Special Rapporteur David Kaye detailed in his new report on business and human rights, Tanzania’s 2015 Cybercrime Act also imposes onerous obligations for companies to monitor content, and the Act has unfortunately become a model for rights-infringing legislation in Africa. These kinds of detentions and prosecutions chill free expression in countries around the world. Clearly, when a fisherman can be arrested on his boat before landing at shore for a Facebook post, as in Malaysia, or a citizen can face jail time for a satirical post, as in Tanzania, it makes people afraid to exercise their right to seek, receive, and impart information. Even though two of the cases in Malaysia were dropped, other cases have proceeded. The threat of prosecution silences people, despite the fact that the right to free expression is protected under Article 19 of the International Covenant on Civil and Political Rights. But civil society groups are pushing back. In Nigeria, activists were able to kill the so-called Social Media Bill, which would have criminalized certain tweets and Facebook posts. A group of activists is instead promoting the Digital Rights and Freedoms Bill (PDF), forward-looking, progressive legislation that has already been introduced in the Nigerian House of Representatives. The Net Merdeka coalition in Malaysia is making a strong and consistent push for laws that respect human rights. Governments can also do their part. The African Union already has the strong African Union Convention on Cyber Security and Personal Data Protection at its disposal for affirming rights. African governments should ratify this instrument rather than considering or promulgating short-sighted, rights-restrictive legislation. The U.N. Human Rights Committee’s General Comment 34 (PDF) provides a good model for restrictions on expression and offers relevant examples. We’ll keep following developments that impact free expression on social media worldwide, and supporting groups everywhere working to defend digital rights. If you’d like to stay updated, we encourage you to follow us on Facebook or on Twitter, or sign up for our free weekly newsletter, the Access Now Express.